I wanted to put up something special for Labor Day Weekend and author and creativity coach Eric Maisel agrees. This essay by Eric Maisel sums up the perfect motivation to achieve the excellent results of our labor. We tend to associate the word “grandeur” with events like royal weddings and sights like the Grand Canyon. Hotels are grand, canals are grand, and cruise ships are grand. But something about that way of thinking prevents us from demanding grandeur from the other stuff of existence, like an image that we craft, a jam that we jar, or a kiss that we give. For more reasons that we can count, grandeur isn’t very present in our daily lives. I remember sitting in a sterile coffee-break room in a suite of offices, writing by hand before the class I taught began. In a corner of the room were some boxes of computer parts. There was a soda machine, a microwave, a copy machine, a fire extinguisher, a sink, a wastepaper basket, and a metal cabinet for office supplies. The walls were a dull blue-gray, the round table at which I sat was the same dull blue-gray, and so were the chairs and the floor. But on the wall across from me was a poster of a Manuel Neri oil-on-paper called Alberica No. 1. It portrayed a woman with a blue face, a yellow torso, and burgundy legs. The top half of the background was a brilliant yellow and the bottom half was a striking blue. If I hadn’t had it or something like it on the wall to look at, I would surely have died of grandeur deprivation in a room like that. Without a Neri on the wall or Mozart in the air or Tolstoy in our hands we would wither away, no matter how good the benefits and stock options at our day job. We need grandeur to survive. As everyday creative people and as artists, it is up to us to supply it for ourselves and for others. But we tend to forget our possibilities and our responsibilities. We forget that we are grand creatures who have it in us to create. We forget that grandeur is available and that we can create it ourselves. One way to prove the exception as an artist is to remember the reality and the importance of grandeur. Demand grandeur from your own work. I’m certainly not talking about subject matter choices: we are centuries beyond presuming that an image of a royal gala or a religious scene is grander than an image of a potato or an abstraction. I am talking about things that arise from our heart, our head, and our hands with the power to move our fellow human beings. I am talking about the intention we hold, to create—choose a word that you like—something powerful, beautiful, admirable, meaningful, resonant, or grand. Maybe there is no right word: but you know what I mean. The painter Max Beckmann said, “All important things in art have always originated from the deepest feeling about the mystery of Being.” I think that this sentiment comes close to capturing the origins of our sense of grandeur. We are built to appreciate mystery, to harbor deep feelings, to contemplate this universe with its marvelous quirks and distinguishing features. To bring less than all of this to the art-making experience is to bring only a shadow of our inheritance. Many artists are approaching the canvas with smaller agendas: to render a likeness, to repeat themselves, to produce something comfortable, to shock, to offer up a copy of something they once saw in a museum. If you come to the canvas with a different, grander intention, you will find yourself proving the exception. The result may not look “grand” in any traditional sense. I would be surprised if we saw marble staircases and velvet drapes. Rather, we might see the color fields of a Rothko, the whimsy of a Klee or a Miro, the earthiness of an Alice Neel. We might see anything: muted colors, saturated colors, political satire, homey scenes, anything. What we would feel, however, would be that special feeling that we crave but only occasionally experience, that feeling of grandeur that is part mystery, part awe, and part receptivity to the facts of existence. How should you approach the canvas in order to achieve these results? You should approach it with your sense of wonder enlisted, with your faculties activated, with a sense of genuine interest and concern, with something more than a desire to make another image or another product to market. In one sense you are simply making a thing; and it is honorable to number yourself among the people who work with their hands and produce artifacts. In another sense you are engaged in existential oratory, commenting in your fashion on the intricacies of existence. When you comment with some feeling, we experience that thing called grandeur. Here are links to events and more interesting reading by this successful author. At the Arlington Arts Center, Washington independent curator, artist, teacher, and critic Rex Weil presents a show focused on the intersection of politics and art-terrain that seldom seems to be explored by artists and galleries in and around the nation's capital. Picturing Politics 2008 will supply a corrective, examining a wide array of strategies used in the contemporary visual arts for addressing controversial issues and promoting progressive social change-all against the backdrop of a political landscape dominated by mass media. Nine individual artists and five collaborative projects will be included in seven separate gallery spaces on two floors of the AAC. Music by DJ Alex Gold. Art Whino's "Block Party," serves as a reflection on art pricing and buying. Solo artist Daniel Fleres and 10 others participating in this exhibition are set to display hundreds of small paintings on wooden blocks. The little wood pieces vary in depth and are designed to be displayed singly, in groupings and even as collaboration pieces. The exhibition is designed around around the idea that art should be accessible to people of all ages and income levels. All works in the show will be priced at the same affordable price. Life and all of its complexities is the source of artistic inspiration for Dan Fleres. Fleres creates streamlined portraits of mournful yet vividly colored characters against skillfully rendered backgrounds. His work is flavored with subtle, insightful views of pop culture and society. Considered an artist of the macabre in his time, Francis Bacon (Oct. 28, 1909 to April 28, 1992) has been on my top list of hard hitters since the 70's. Bacon's instinctual expression and psychological content both fascinates and repells. In London last July, Study for Head of George Dyer, 1967, by Francis Bacon sold for a cool £13.8m with buyer’s premium. Gone but not forgotten, read The Art Newspaper's Francis Bacon claims his place at the top of the market. “Francis Bacon” is at Tate Britain in London from 11 September to 4 January 2009. The exhibition travels to the Museo Nacional del Prado in Madrid (3 February-19 April 2009) and the Metropolitan Museum in New York (18 May-16 August 2009). The Elders Learning Through the Arts (ELTA) Program offers funds to individuals and organizations serving District residents, ages 60 and older, in arts programs. The Commission recognizes that senior art programs are a growing field and one that has shown great benefit to older adults. Grants will fund projects in the following areas: crafts, dance, literature, media, music, interdisciplinary/performance art, theater and visual arts. Funded projects will support innovative arts programming that provides access and positive enrichment alternatives for seniors. District residents and District based organizations may apply. Grant amounts range from $500 to $5000. Visit dcarts.dc.gov to download an application. Creating a temporary bartering locale, open to the public for 3 days, The Floating Lab Collective has set up a series of objects within Transformer's project space, encouraging visitors to take an object in exchange for an object they leave behind. To document and archive the exchanges, a Floating Lab Collective artist will be on site to make a quick drawing of each item as well as record its known history. These sketches will be displayed in the space as a growing record of material culture through the duration of the project. About the project, The Floating Lab Collective states, "This project uses 'bartering' to create community exchange. The purpose of bartering in this instance is to subvert both its semantic value and the traditional context of the art object as mercantile in nature. This project places the object in a social interstice, basically removed from the law of profit by emphasizing the sociability of the object in the context of bartering." BARTERING HOURS for Bartering in the Land of Abundance are Thursday - Saturday, 1-7pm. OD 1152 is the name of a tree located inside a forest outside the small town of Michelstadt, in the Odenwald region of Germany. The forest is now a cemetery, a place where peoples' remains are buried in biodegradable urns amongst the roots of the tree of their choice. In 2007, the Mexican artist, Ricardo Mazal traveled to Odenwald and he became fascinated with the concept of these burials. He photographed the forest extensively and upon returning to his studio, Mazal used the photographs as a point of departure - digitally transforming and merging them with images of his own paintings - to create virtual studies for new paintings. Hebraica Mirrors is a series of original colorful prints by the French Jewish artist Matatiaou. The exhibition travels from the Jewish Museum of Florida. Hebraica Mirrors includes over 60 fine prints on Arches Velum and leather parchment. This type of medium truly represents the crossroads of contemporary design and traditional calligraphy. The exhibition is an interpretation of the Hebraic letter that develops numbers, shapes and colors in mirror effects. This universal graphic interpretation is inspired directly from the Zohar (direct origin of the Kabbala as written circa 1300). Ilan Stavans will be sharing the transitional history of Hebrew from a dead language to the living language of modern Israel. Stavans is a Professor in Latin American and Latino Culture at Amerherst College. The book talk is part of the Hyman S. & Freda Bernstein Jewish Literary Festival. TICKETS are now on sale! A BIG!!!! Celebration at the John A. Wilson Building is planned for Tuesday, September 23rd, from 5-7pm......a reception in the Wilson Building to celebrate the art collection and the centennial of the building. THE Public IS invited. 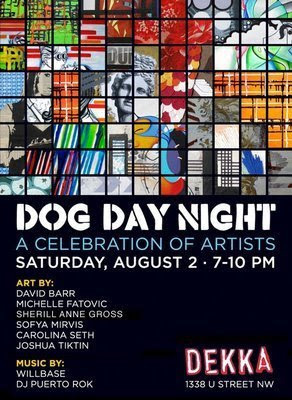 So come out and support your local artists and arts commission. YOU can make ART continue to be a BIG PART of our fair city. 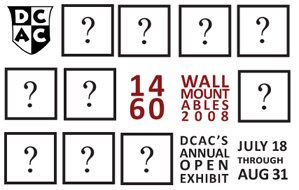 Let's deliver impressive numbers of people to this event to show the council, the mayor and our arts commissioners, our support for the artists and the mission of the DC Commission on the Arts and Humanities. MAAF's Creative Fellowships Deadlines Approaching! Creative Fellowships Artists' Colonies Residencies! Mid Atlantic Arts Foundation annually supports regional artist in residence at The Millay Colony, Austerlitz, NY, and the Virginia Center for Creative Arts, Sweet Briar, VA.
Residencies support writers, composers, and visual artists. The visiting artist is provided with a private studio, room and board, and the company of other artists from around the nation, for an intensive period of self-guided creative exploration and development. The Montgomery County Art Association and the Town of Kensington, MD, host Kensington's annual Paint the Town art show every Labor Day weekend. The event had its tenth anniversary in 2004. For the event, artists paint in the open air at sites across the Town of Kensington and have their artwork judged and displayed that afternoon. Artists from all over the metropolitan area display a colorful array of paintings, drawings and sculpture. Information about the upcoming event is posted on the Kensington Web site prior to Labor Day every year, so keep an eye on the Labor Day Parade & Festival page. "Living Sculpture" by J.J. McCracken is a series of performances that showcase the beauty of clay's transformative qualities joined with the dramatic presence of staged figures. Artists displaced by downtown development will celebrate their return at 923 F Street, NW beginning 6:30 PM Friday, September 5. The return highlights "extraordinary cooperation in preserving cultural assets downtown," stated Downtown Artist Coalition President (DAC) Michael Berman. The cooperation was spurred by DAC, which was formed in 1999 to organize the many artists who were facing possible eviction by redevelopment of the 900 block of F Street. 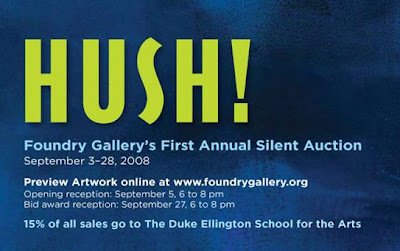 The effort to preserve some of the last remaining artists' studios downtown culminated in a 2001 agreement which ultimately involved not only DAC but also the Committee of 100, the DC Preservation League, the landowner, the Archdiocese of Washington; the developer, Akridge; and the District government. Included in the new Carroll Square development at 975 F Street, NW, is 7000 square feet of working art studio space, now leased from Akridge by DAC, which subleases 6 studios to many of the artists who originally occupied space on the street. Called F St|Arts the studios occupy the 2nd and 3rd floors of the preserved and rehabbed townhouses that are incorporated into the development. Paintings, photographs, sculpture, crafted jewelry, and wood furniture are some of the artwork that will be featured in the space. 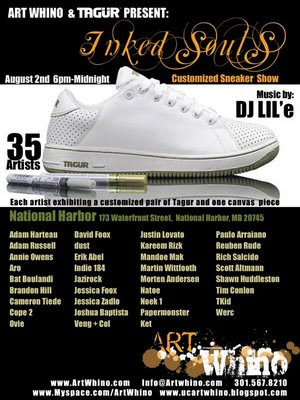 Artists will be producing as well as displaying work. F St|Arts will hold quarterly open studio events, in conjunction with the gallery located in the Carroll Square lobby, as well as other functions. Studios are open by appointment only in August. Public hours of operation will be announced in September. Reyes + Davis. Independent Exhibitions. International Arts Artists invites you to come HOME this Friday, August 15th! Welcome new host Fred Joiner, curator and host of the American Poetry Museum's Intersections at the Honfleur Gallery and poet in residence at Busboys and Poets, Shirlington. This month's feature poet is Christopher K.P. Brown, fresh off of his summer tour for the fourth installment in the HOME series. Brown's most recent work explores the topic of Black male identity, which is the dominant theme of his latest release, POETRY: a hip hop album. HOME is on every THIRD Friday of the month. 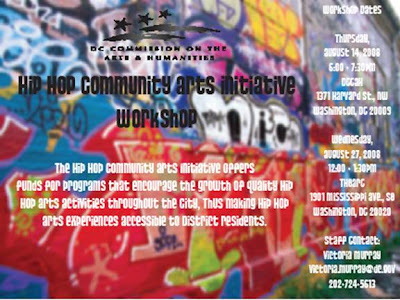 First time applicants and small organizations are strongly encouraged to attend workshops. Call for locations. Dana Ellyn and Matt Sesow are back from a month long trip to China. In lieu of their annual 31 Days of July series, Dana and Matt will be exhibiting exciting work made while on their trip to China. 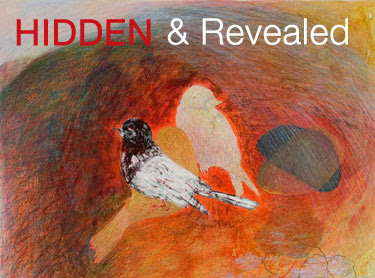 Gallery Talk with curator Peter Dubeau and participating Hidden & Revealed artists. 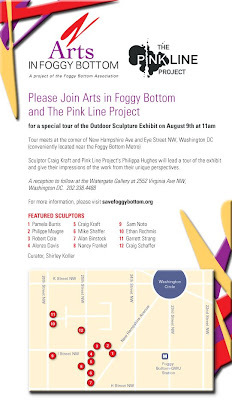 This Saturday, August 9 at 11am Sculptor Craig Kraft and Philippa Hughs of Pink Line Project will lead the tour. 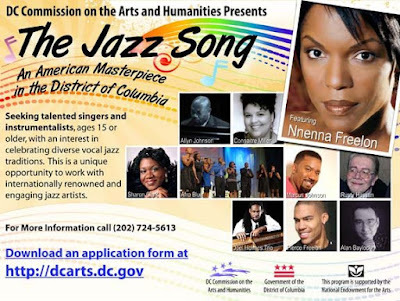 The DC Commission on the Arts and Humanities is proud to announce the start of The Jazz Song, a workshop and performance program of the American Masterpieces project sponsored by the National Endowment for the Arts. This celebration of diverse vocal jazz traditions begins September 16. Workshops held at venues citywide will be open to select area performers and composers and lead by accomplished jazz masters. The project will culminate on Sunday, September 21st at 6:00 p.m. in an open-to-the-public concert showcase at the Enrique V. Iglesias Conference Center of the Inter-American Development Bank, the event co-sponsor, featuring the best students gleaned from the workshops along with lead DC area jazz artists. Happening again for the third time on a worldwide basis September 14-21. 2008. Be there to fill in a square! The dates for CHALK4PEACE have expanded so you have the WHOLE WEEK to paint the planet the colors of peace! Enjoy drinks and refreshments at our new space. View Turning the Page on our monitors and meet the artists. 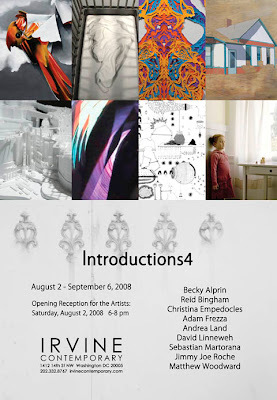 Civilian will be taking a short summer break after Quart Bag reopening on September 5, 2008 with Way Down in New Orleans, an exhibition of over 33 artists from across the country whose work and lives have been affected by Hurricane Katrina. 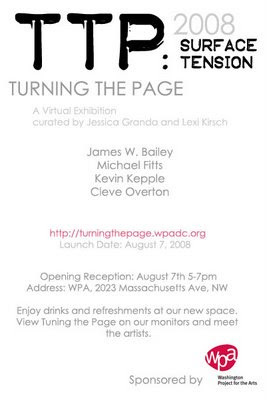 The exhibition will be curated by Aubrey Edwards, organized by Civilian Art Projects, and fiscally sponsored by DC Arts Center. , and much, much more. Come out and hear how popular culture has changed our perspective in these alternative annals of history. Join the park ranger for a three-hour bike tour of the National Mall that explores the magnificent architecture of John Russell Pope. Few architects have played a greater role, in terms of major architectural contributions, to the appearance of modern Washington, D.C., than J. R. Pope. Pope was noted for his strict adherence to classical forms of architecture, and was referred to as the last of the Romans. The tour will consist of visits to & discussions of: The Lincoln Memorial, The American Pharmaceutical Association Building, Constitution Hall (D.A.R. ), The National Archives Building, The West Wing of the National Gallery of Art, and The Thomas Jefferson Memorial. And this is the month of those generous Leos. You know who you are. Happy Birthday to every one of you! First Friday Reception: Friday, August 1, 2008, 6-9 p.m. If you missed the opening last month and haven't seen them yet this is your chance to see what everyone has been talking about! Jason Reynolds and Jason Griffin are a collaborative artistic duo making their exhibition debut in Washington, DC at IA's Hillyer Art Space. The pair is best known for their visual and performance art, which seamlessly mesh together Reynolds' poetic prose with Griffin's expressive paintings. Mandy Burrow features five installations that explore life, death and resurrection. Through this artistic investigation, Burrow confronts the issue of time and its effects on memory. highlights Ben Tolman's signature style of intensely detailed and micromanaged, large-scale ink drawings. Expanding from his obsession with monsters, fantastical creatures and unusual and bizarre scenes, Tolman presents a series of drawings exploring the human condition. An international traveling exhibition by Gallery 10, Ltd artists from Santa Reparata International School in Florence, Italy. Thanks Sharon @ Authentic Art Visions! 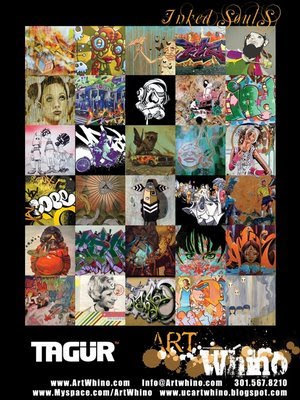 Art Whino joins forces with Tagür Footwear to present Inked Souls, an exhibition featuring customized sneakers and fine art by 35 local, national and international leaders in the Pop Surrealism/Urban Contemporary art movement. If you haven't yet seen the exhibition of wood sculpture by Martin Puryear at the National Gallery of Art, I'd hop the metro and plan to spend an hour wandering thru this Washington born artist's installation. 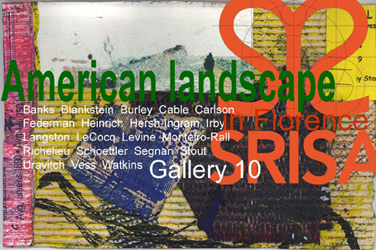 This is the first American retrospective of the artist's work in more than 15 years. There's a large ebony head form, which I love, that is ripe with sensual overtones and a delight to observe for its simplicity and poetic vision. Also catch the 36-foot-long ash and maple Ladder sculpture in the Rotunda. Many of the sculptures are woven together in a lattice-like style. It's a very impressive exhibit and worth repeat visits. A catalogue of the exhibition is available in the museum shop.